Now updated with more photos. This entry comes to you from the very crowded standing room line for Juan Diego’s Nemorino. I will add more pictures when I have a better internet connection. 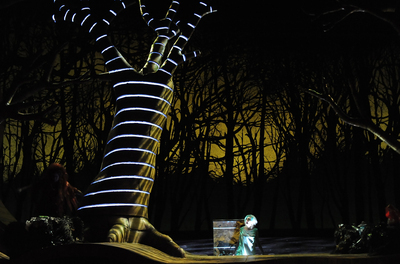 Rusalka is an ethereal, blond woman in white who wanders aimlessly. Fuzzy orange Snuffleupagus-like Jezibaba can make the scattered trash bags dance (their choreography resembles that of the nymphs), which, well, I’m not sure what it symbolizes. After transforming Rusalka by way of feeding her some somewhat moony LED lights, she transforms herself into the Foreign Princess (though the roles are sung by two different singers). So Jezibaba tests the Prince in Act 2, and he fails. But there are some nice visual touches. The Falstaffian Gamekeeper (complete with antlers), the bicycle-riding Man in the Moon, the Kitchen Boy wearing a pot on his head, and the first appearance of the fat hunters are all delights (though I couldn’t locate any of them except the fat hunters in the production photos). 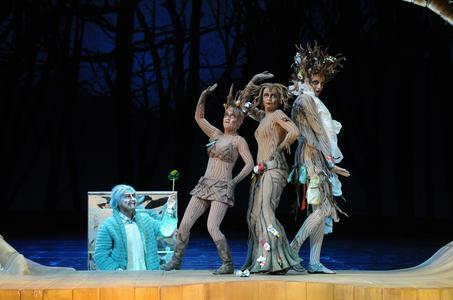 In the production’s darkest moment, one of the wood nymphs seemingly unknowingly picks up a stray can of gasoline and douses herself, not that we see her go up in flames. Unfortunately the much-vaunted dancing trash bags are over-used. And both of these things contribute more to the general concept than they do to telling the story. Aleš Briscein was a stiff Prince with a pleasant tenor voice without particular lyric beauty or power, and an unfortunate tendency towards cliché tenor hand gestures. Dubravka Musovic was an excellent Jezibaba (redundantly credited in the program as “Die Hexe Jezibaba”…. guys, “Jezibaba” just means “Die Hexe” [Witch] in Czech) with the kind of Slavic mezzo that can peel paint but you like it anyways. Victoria Safronova was a very loud Foreign Princess with far too much vibrato to settle on any pitch, and incomprehensible German. Mischa Schelomianski was a woolly but amiable Water Goblin. One of the nymphs was out of service and being sung offstage by someone else, which made their trios somewhat rocky, and was probably the cause of that exceptionally bumpy start. Henrik Nánási conducted with flowing tempos and excellent details, and the Volksoper orchestra sounded good despite some wayward brass entrances. Kušej is the equivalent of operatic absinthe: probably inadvisable in large quantities. 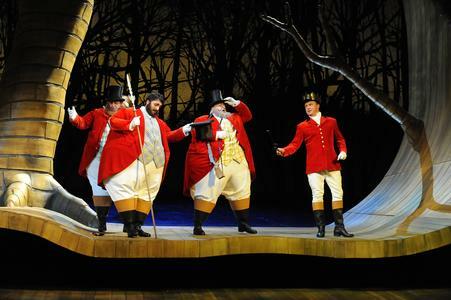 Barbe and Doucet’s production is accessible, enjoyable, and reasonably creative. This might not sound like a ringing endorsement–truth is, Kušej is also lots more interesting to write about–but sometimes you just want your operas without dissection, right? There are many remaining performances, some with an alternate cast.